Banners can be used for a wide variety of purposes and can be created from a wide variety of materials. So, which banner is going to be right for your needs? 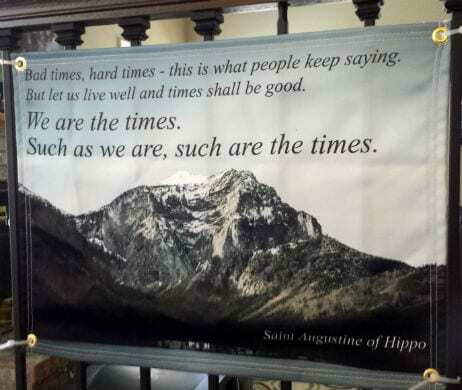 Vinyl banners, fabric banners, or mesh banners? There are limitless display options for these types of banner materials, so choosing the right one may be somewhat of a daunting task. Knowing which banner to use can help you maximize the quality of your display and prevent any dissatisfaction from choosing the wrong type of banner material. We’ll take a look at the three most popular banner types, the material used to produce them, and how each offers unique display features for business and home use. While you’re learning about banners check out blog posts on how to hang your banner or the different banner finishing options available. 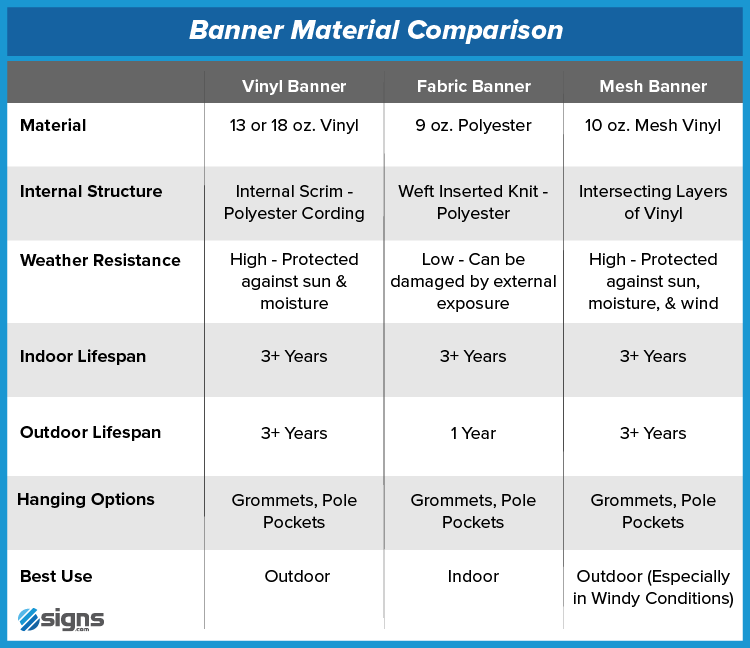 Before we dive into the individual features of each banner type, let’s take a look at how the material affects the structure of the banner (don’t worry, all banner types discussed in this post offer great durability and versatility). While you don’t need to memorize the terms below, or even fully understand them, these more technical descriptions of our custom banners go to show why they are such a versatile and durable signage option. Internal Scrim: Banners can be constructed using an internal scrim, which reinforces the material and provides additional stability. Internal scrim is a weave constructed from a heavy fabric that is placed as the center/internal layer of the banner. In the case of vinyl banners, a polyester (plastic-based) cording is used as the internal scrim. This scrim is then covered by a polyurethane-based layer (which is the layer where designs are printed). Weft inserted knit: Similar to an internal scrim, a weft inserted knit is a strong weave of fabric used as the foundation for banners.In the banner industry, it’s common to use either a weft inserted knit or an internal scrim, as the two are nearly indistinguishable and perform the same function of reinforcing the banner from tearing or punctures. Our fabric banners are constructed using a weft knit, adding additional strength to the core of the banner. In fabric jargon, a weft is a cross threading of fabric that weaves through the warp, which is typically placed lengthwise or longitudinally on a loom (a machine to weave fabric). In short, a weft provides additional strength for the banner. Like with an internal scrim, the weft inserted knit is sandwiched between layers of polyester fabric to form the smooth finished surface of the banner. Mesh pattern: As you probably guessed, a mesh pattern is used in mesh banners to add tensile strength while offering a transparent nature to the fabric. The mesh pattern is created from intersecting layers of vinyl, pressed together to form an incredibly strong and lightweight substrate. 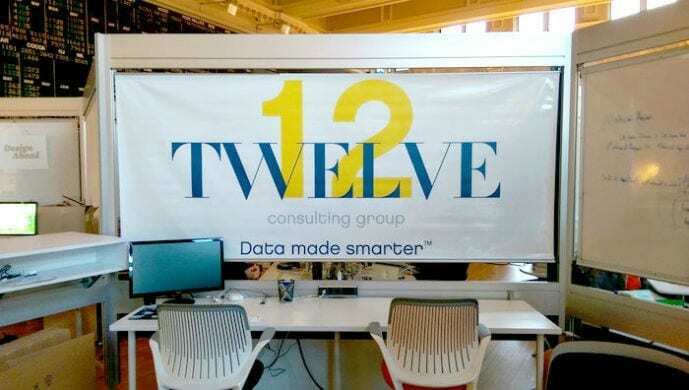 Thus, our mesh banners are incredibly durable despite not being produced with a “woven” approach like vinyl and fabric banners. A mesh pattern is used to allow wind to easily pass through the material without having the risk of damaging or tearing the banner. This makes this a great option for outdoor use, especially in windy conditions. Weather Resistance: Vinyl and mesh banners are perfect for weather resistance while maintaining impressive durability. The heavier denier (thread thickness – learn more by visiting our post on denier) polyester used in both vinyl and mesh banners will wick away water without damaging the design or quality of the product. Except in extreme weather, both can be used outside for years to come. Alternatively, fabric banners are not designed to be weather resistant; their lightweight polyester is not suitable for prolonged contact with liquids or sunlight. Exposure to direct sunlight for prolonged periods of time will cause your banner to fade. 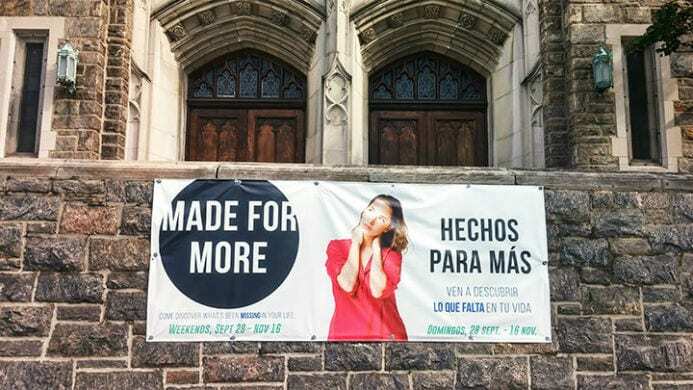 Fabric banners generally do just fine outside for approximately a year and will last much longer when used indoors. Material (Polyester vs Vinyl): Though they are both made from a type of plastic and are often mistaken for one another, polyester and vinyl are not the same material. To the naked eye, it might be hard to tell one from the other, but microscopically, they are different. Polyester is formed from polymers and esters (which is how the material got its name). Polymers are a molecular structure with similar molecules that are bound together, resulting in the fibers of a polyester strand, while esters are comprised of an organic compound. 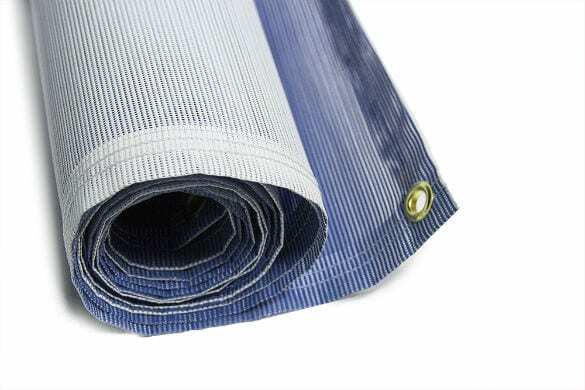 Polyester is typically used as a fabric. Vinyl is comprised of a type of plastic made from ethylene and chlorine. When ethylene and chlorine are combined, they form a polyvinyl chloride (PVC) or in other words, vinyl. Vinyl can be used as a fabric or harder, more plastic-like structures (think PVC pipes). Our vinyl banners do use a polyester scrim with vinyl layers on each side, which is why we refer to them as ‘vinyl’ banners. To provide a quick overview, vinyl and mesh banners use a vinyl material that is designed for outdoor use (with impressive water resistance) while fabric banners use a lighter, elegant polyester for indoor display. Weight/Thickness: Though our vinyl, fabric, and mesh banners all use a variation of polyester material, the thickness and structure (as outlined above) differs. 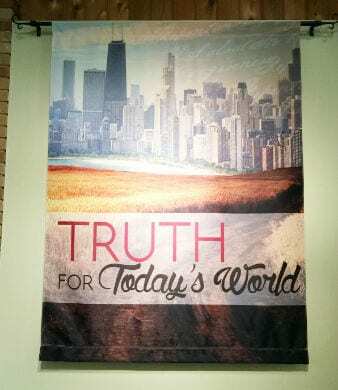 Fabric banners use a lightweight, 9 oz. polyester whereas vinyl banners use a heavier 13 oz. (with an 18 oz. option) polyester, coated with a vinyl layer. Mesh banners use a 10 oz. PVC material (vinyl). What exactly does this mean? The ounce count for banners correlates to how many ounces of the material are in a square yard. Typically, the higher the ounces, the thicker the material. Tensile strength (the ability to withstand tearing or ripping with tension) usually increases as ounce count increases (when comparing the same material). This concludes our section on going through the many terms used when discussing the material used in creating vinyl, mesh, and fabric banners. Let’s now dive a little deeper and cover each type of banner offered and their main material characteristics. 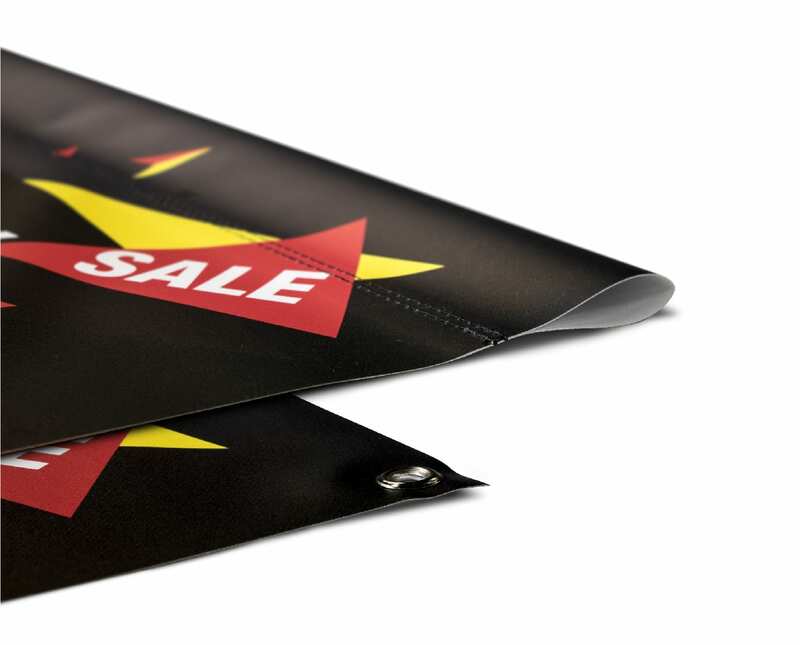 Vinyl banners are the most durable and commonly used banners for outdoor display purposes. Choose between a 13 oz. or 18 oz. vinyl to print on, depending on your intended use. Typically, the heavier the material, the greater the durability. Thirteen ounce (13 oz.) vinyl is your best bet for everyday display. Don’t let a lightweight material fool you; this banner is impressively durable and versatile. Case in point, our 13 oz. vinyl material is the same material used for billboards! Eighteen ounce (18 oz.) vinyl is a special-use material for heavy-duty display (like at construction sites). As we mentioned above, a higher ounce count means greater durability and tensile strength. Regardless of weight, vinyl banners offer exceptional image quality and display versatility. Vinyl offers a semi-gloss appearance, which can be noticeable when light shines on the surface. Avoid placing banners in direct light to reduce visible glare; the less glare, the clearer the design. Since vinyl banners are heavier than fabric or mesh, we recommend choosing one of our grommet options that places grommets around the edges of your banner in addition to the four corners. This will ensure it is pulled taut when displayed (this is especially the case with larger banners) and gives you more anchor points to securely display it, regardless of the conditions. Another common way to display a vinyl banner is by using pole pockets to suspend the banner from a pole or from rope. Designed for both functionality and aesthetics, fabric banners present a beautifully printed image with impressive quality. Lightweight polyester contributes to this banner’s exceptional functionality, allowing the banner to be easily transported and displayed (which makes decorating easy at events hosted in venues or satellite locations). Fabric banners offer a slight transparency; displaying in front of windows or light sources will allow light to illuminate through the material (of course, this effect is not comparable to the semi-transparent nature of mesh banners). Fabric banners are meant for indoor use, though displaying outside is possible as long as you avoid doing so in heavy rain or wind (inclimate weather is bad in any display situation for these banners). Hanging fabric banners from a ceiling or awning is a typical indoor (and sometimes outdoor) method for professional displaying. As with vinyl banners, fabric banners can either include grommets or pole pockets to help you hang your banner in the ideal location. The mesh construction used for our mesh banners reduces weight and allows wind and light to pass through the banner – don’t worry, the quality of the printed design is still maintained. 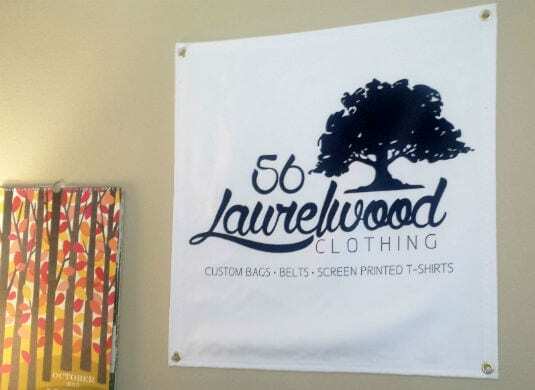 It’s important to note that the colors and graphics on these banners are often described as “lighter” or “muted” when compared to their vinyl and/or fabric counterparts. For the best image quality, mesh banners are best viewed from a distance. 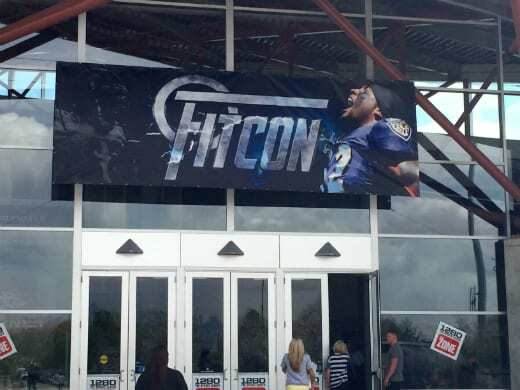 Functionality is the name of the game for mesh banners, especially when displayed outdoors, as they boast both wind resistance and a semi-transparent effect when displayed. The 10 oz. PVC mesh offers exceptional tensile strength while preserving the lightweight form. This mesh pattern has a ratio of 70:30; meaning that 70% of the banner is actual material whereas 30% is made of very small holes. Mesh banners include hemmed edges to ensure that the material does not tear when pulled taut during display. 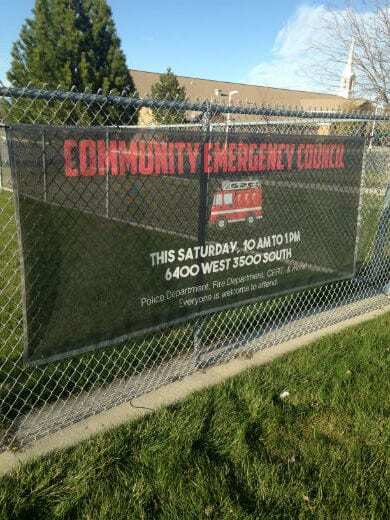 One of the most popular ways to display mesh banners is on chain link fences. Doing so will emphasize the semi-transparent nature of the mesh pattern, allowing you to display a design without completely blocking out the surface and the background it is covering. If you are planning on installing your mesh banner on a chain link fence we recommend including grommets on your banner, as they make it very easy to attach your banner to the fence at multiple points, using short ropes or zip ties. Vinyl banners are your best choice for outdoor banners and signage because…. The construction on vinyl banners lends to its versatility for outdoor display. 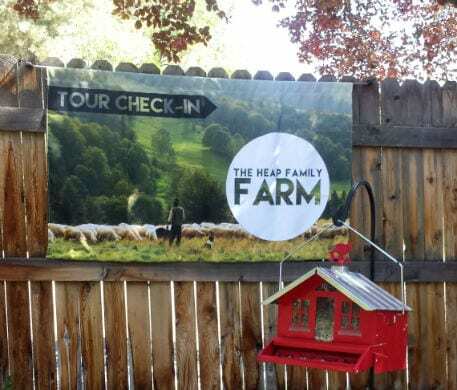 Vinyl itself is a water and UV resistant material, allowing you to use this type of banner outdoors for a longer period of time without it becoming ripped, torn, or faded. The ability to hang them virtually anywhere makes vinyl banners the MVP of outdoor signage. If you’re looking to display a banner in windy conditions or offer a little bit of privacy (like covering a construction site fence) then we’d recommend using mesh banners. Fabric banners are designed for incredible indoor display. We can’t praise enough the impressive color and details of printed designs on fabric banners. Pictures don’t do them justice but here’s a few examples of fabric banners in their natural habitat to show you how brilliant they are. We know we’ve talked a lot about banners and it’s a lot to digest. So, we’ve put together a simple chart below to get a quick comparison of each of our banners and a summary of the information we have discussed. Regardless of your banner choice, all banner types are customizable; your design will be printed to impress! Need help making that eye-catching design? Our free design services can help! If you still need some assistance in choosing the right banner for your needs, give us a call at 888-222-4929.